As a branding agency, your deepest cuts are the ones no one sees. While many brands include iconic pictures, there are many more failed brands using too much creativity. Imagine how dated the timeless Star Wars font would be if it contained a 70’s style star. Think of the implied limitations if Lego’s simple four letters also included their block holes. Some branding may even unwittingly foreshadow a company’s doom such as the throwaway ticket stub image of Blockbuster or the kicked to the curb Pinto logo. One wrong detail can take away a brand’s lasting impact. Growing corporations regularly up cycle their brand in carefully strategic ways. Like the ongoing simplification of Starbucks and Amazon logos, some companies keep their identity recognizable while emphasizing new possibilities. Others, like Disney or Darden, drop part of their name to expand and some, like Airbnb and IHOP, add something new. Change itself isn’t inspiring, but purposeful changes are. Your branding should allow you room to grow. You want to live into your potential so remember the simplest brand image doesn’t always win, the one that connects the most does. Being creative is not always about making the most novel concept, sometimes it is about making the one so well-edited it feels natural and effortless. Congratulations are in order. Local artist Jim Bachor made the news last week for his creative way of fixing Chicago’s potholes. 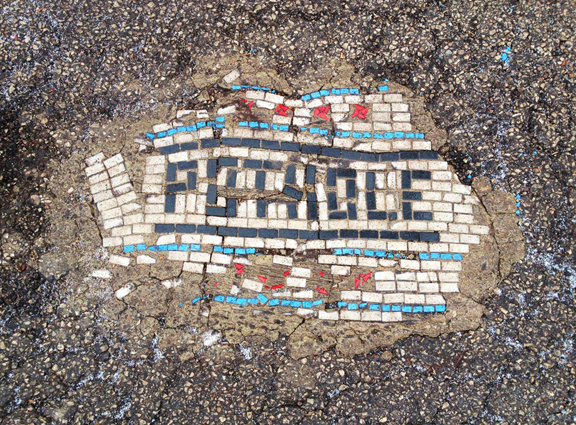 Rather than covering potholes with a standard heap of tar, Bachor has been filling the ban of Chicago drivers with his unique, mosaic artwork. Fox News chronicled the creation of his latest art installment in four segments that you can watch here. For contact information or to see more of Jim Bachor’s work, visit his responsive website (that C2 Creative produced) at http://bachor.com. Droga5 has pulled off a Super Bowl media coup d’état with a series of very entertaining anti-spots for Newcastle. We applaud the asymmetrical assault on the otherwise over-the-top antics typically found in Super Bowl commercials. Marketers will definitely relate to these video spots with their behind the scenes perspective. Go to www.ifwemadeit.com to see the campaign play out. You’ll even notice the poor product shots that most likely resulted in a raise for someone. Or at least a pat on the back. After taking a two-year hiatus, CarMax has gotten back in the game with a Arsenio Hall inspired spot. It was tough to choose between M&M’s and Oikos, but when it came down to it we opted for chocolate over yogurt. Our wildcard pick was a no-brainer. The teaser Axe released is creative and beautifully done. Richard Sherman, who’s featured in the teaser, has been the talk of the town since he lashed out on his post-game interviewer. That should guarantee a few shares. Selecting Bud Light in our draft is kind of like selecting Tim Tebow for a 2011 fantasy leauge. You hate to admit that he’s on your team but by some small miracle there’s a chance he could score a few points. 1. How many babies will appear in this year’s commercials? Three. However, due to a casting gaff, each spot will feature the same baby. 2. Will Miley Cyrus appear in an ad? 3. How many brands will include a hashtag onscreen? 4. Will any brand air a spot longer than 60 seconds? Sorry, we were just texting while catching an old GOT episode. Can you repeat the question? 5. Which category will finish with the highest average score? We only care about the category that finishes with the lowest score, as that’s who we’ll be calling on Monday. 6. How many tweets will the most tweeted about brand receive? 150,000 — all from George Clooney. Ready to make a wager? Head over to PlayFantasyBrands.com to pick your winners. As everyone may have noticed, there seems to be a new trend on the rise this year with Super Bowl advertising- teasers! In years past brands guarded their Super Bowl ideas like a chubby kid protecting his last chocolate bar. However, this year a lot of brands have been rolling out sneak previews, giving us a glimpse of what they have in store for Super Bowl XLVIII. A lot of them are fantastically weird, and funny. For your viewing pleasure, here are six we felt worthy of sharing.